Since we’ve moved here I have not had an official office. All my office-worthy things are spread all over the house. My laptop lives either on my night stand (bad habit!) or on the kitchen table. I have chargers at each location. 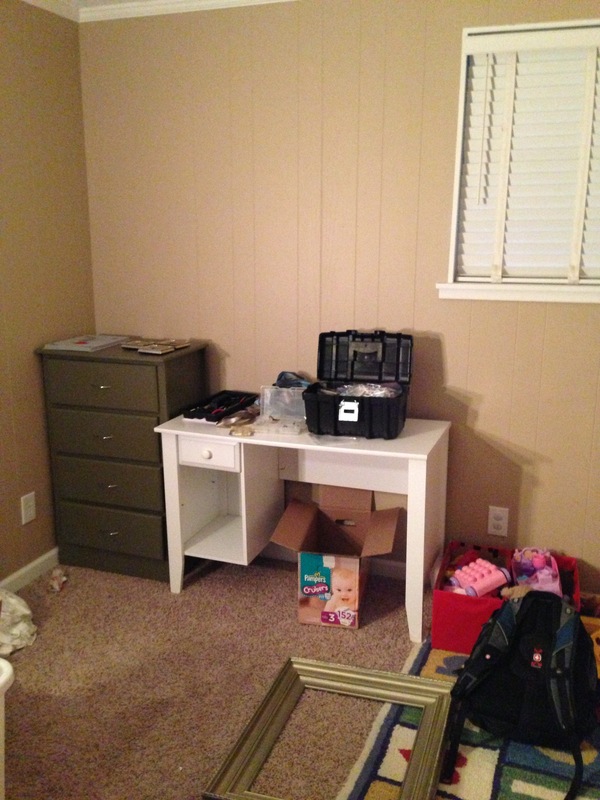 A desk with paperwork, files and half of my jewelry supplies cluttered the quest room while the rest of the jewelry supplies floated where needed in a Pampers box. Art supplies are in 5 different places and tools are in the hall closet. With the given space, I was as organized as I could be but it just wasn’t cutting it. 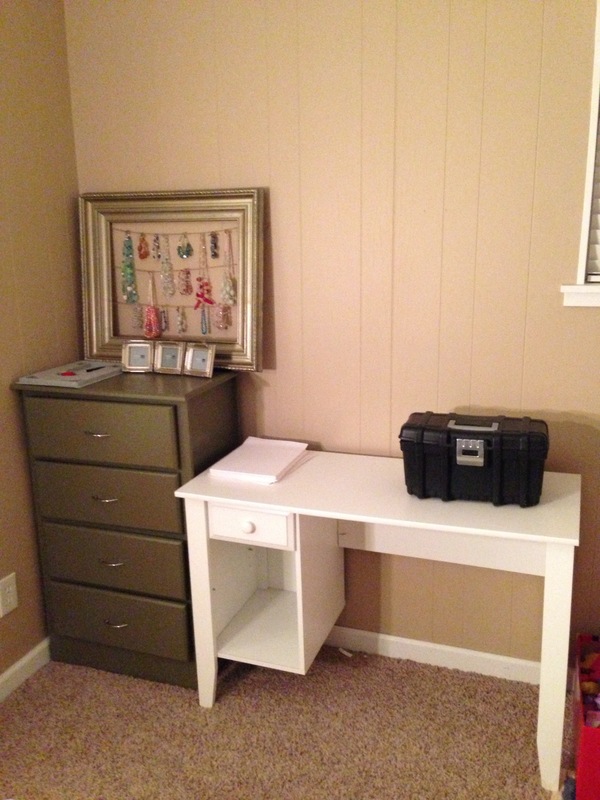 Hubby kindly moved our old dresser to the basement and brought the desk down from the guest room too. The basement already serves many purposes from exercise room and man cave to living room, play room and laundry folding zone. The space isn’t large but we do our best to use it well. The only undedicated space is the corner between the play area and the laundry room. 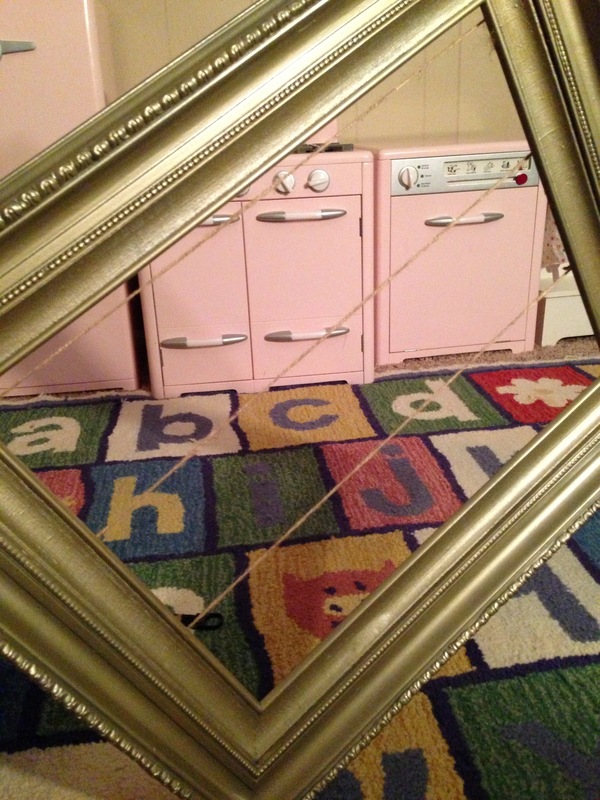 A whopping 10 square feet… and I will make it MINE! (Cue evil Cruella DeVille cackle) Excuse the mess… It didn’t occur to me to take pics until I was elbow deep in beads, art supplies, tools and organization. 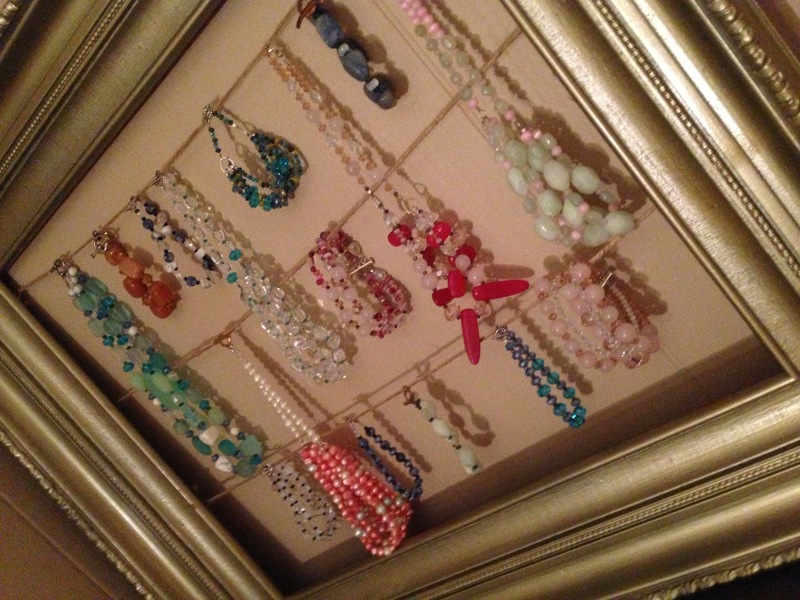 I also filled the dresser drawers with my bead supplies and made a jewelry display from a big picture frame. 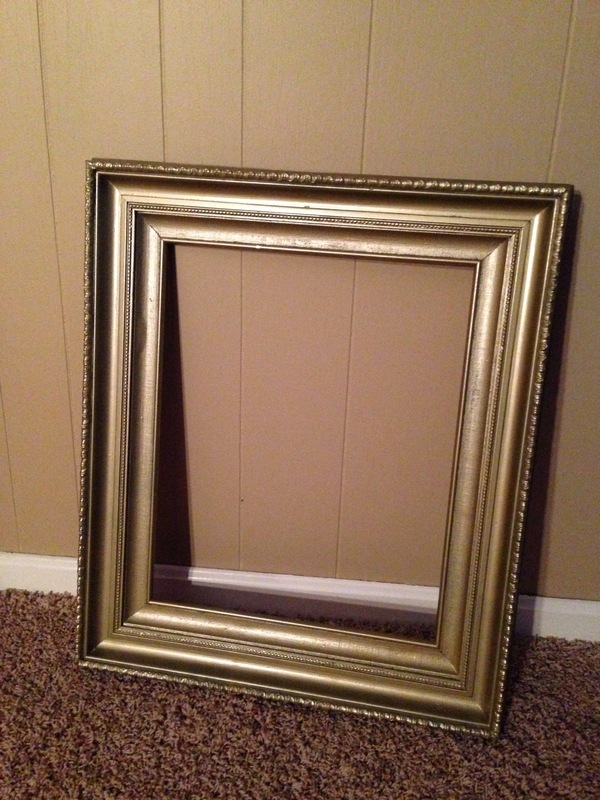 To make the jewelry display I grabbed one of the big frames from my collection I used for the Christmas mantle display this year. 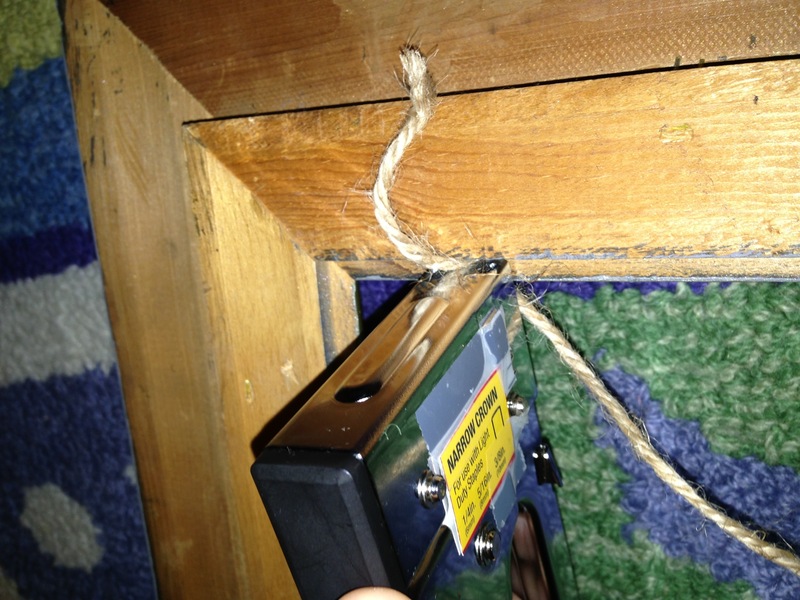 I attached twine (also from the mantle project) to the back of the frame tightly with a staple gun. 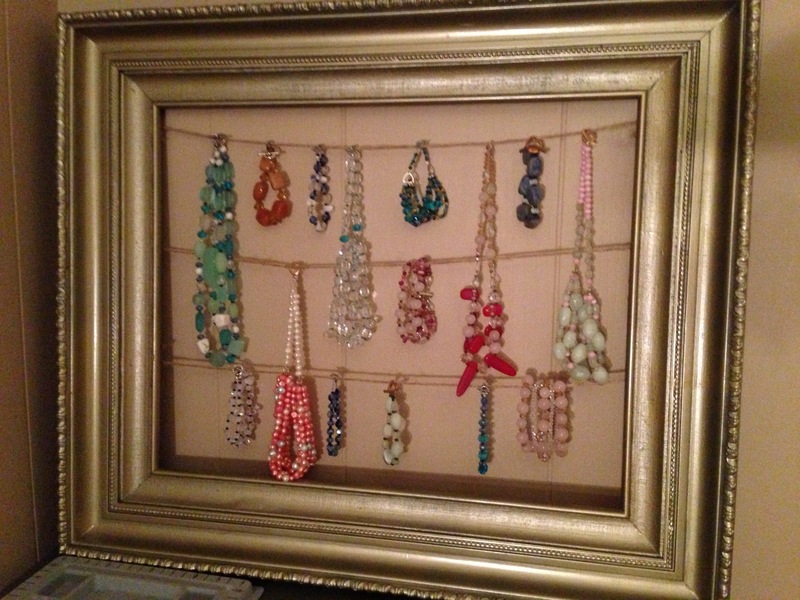 I only ran 3 strings so I could have lots of room to hang longer jewelry pieces. Easy Peasy! I’ve cleaned up my Etsy shop and added a few new finished products. 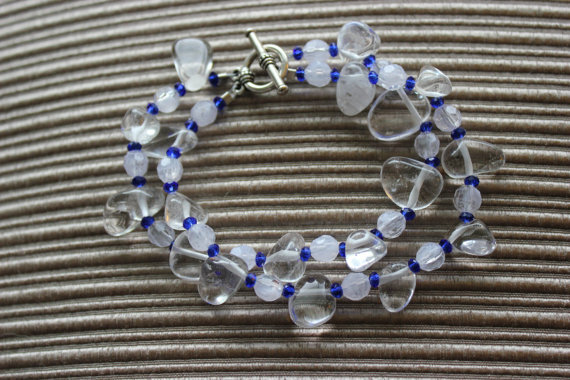 It felt so good to sift through some of the junk and add my newest creations…. like spring cleaning! But I always forget all the work it takes to post everything. After my work for hours on all of these pieces, I always call up my sister and ask her to model for me. She usually jumps at the chance to “model” and I trade her for some time tweaking her resume (I like doing that stuff actually). She makes a great model: she’s petite, flawless olive skin (people always think we are Greek), and decently good at sitting still. And I bet she’ll love reading this. Then I have to choose which photos to post, price everything accordingly, write killer descriptions and then shamelessly promote/pin/facebook/tweet all of my listings. I’ve tried to expand my price point. 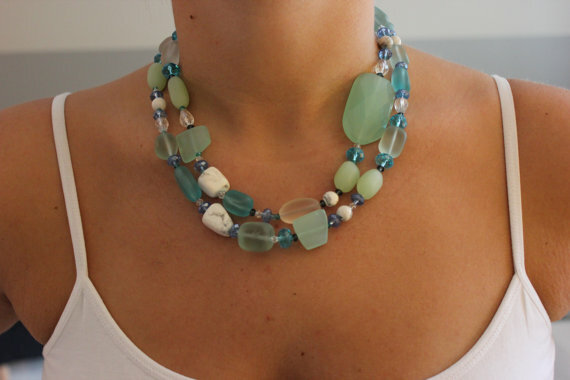 There will be more affordable pieces under $30 or $40, though necklaces are inevitably more expensive. Glamour and fashion should be fun and affordable for everyone. I will be getting a new “header”…. perhaps something to coordinate with the blog. Not too logo-y but at least give Hilda a little more of an identity. More photography, less paintings. For a number of reason: paintings are time consuming, dining room consuming and don’t sell as well. Additionally, they are a royal pain to ship. Photography seems to be more popular and much more enjoyable and flexible for me to create. STAY TUNED! I’m planning a couple more halloween decor posts, small projects as well as a few before and afters around the house.